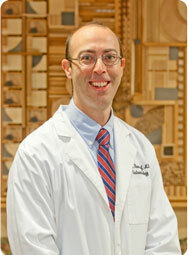 Dr. Rosendorf is Board Certified in Gastroenterology and Internal Medicine. He completed his Internal Medicine residency at Tufts-New England medical Center in Boston, Massachusetts in 1998 and his Gastroenterology Fellowship at UMDNJ in Newark, New Jersey in 2005. Dr. Rosendorf provides comprehensive diagnostic and therapeutic care within the field of Gastroenterology, including interests in colorectal cancer screening, acid reflux and acid related disorders, inflammatory bowel disease, irritable bowel syndrome, liver and pancreatic diseases. He has extensive experience with many diagnostic endoscopic procedures including upper endoscopy (EGD), colonoscopy with polyp removal and ERCP.